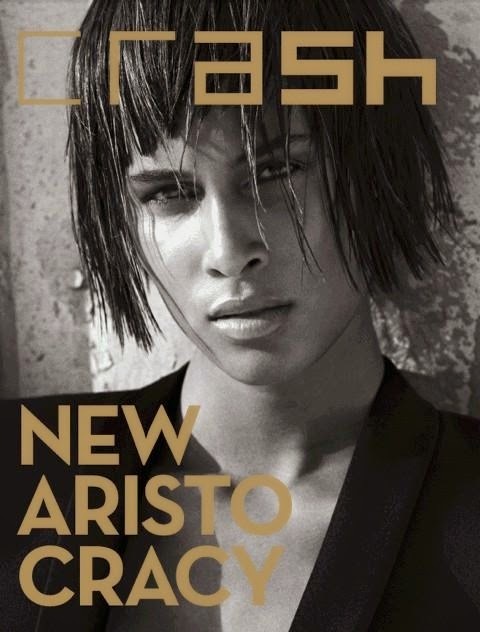 French modelling sensation Cindy Bruna displays jaw-dropping versatility for the Special Mode issue 69 of Crash Magazine lensed by Dan Smith on a New York City rooftop. With a focus on diversity and a modern beauty aesthetic, Bruna was a clear choice for casting duo Elodie Yelmani and Neill Seeto. Bruna checks her Victoria's Secret wings in exchange for a powerful androgyny wearing slick black ensembles styled by Katie Burnett from the Fall/Winter 2014 collections of Yigal Azrouel, Donna Karan, Tom Ford, Saint Laurent, Barbara Bui, and Akris. Bruna is rendered virtually unrecognisable courtesy of a blunt fringed nape grazing bob which accentuates her high-sculpted cheekbones and penetrating gaze. Dan Smith trains his lens on Bruna's magnificent 180 cm frame as she poses propped up against a stair railing with the Manhattan concrete jungle looming on the horizon. Bruna has plenty of reasons to smile of late having recently celebrated her 20th birthday coinciding with cover appearances on the 50th Anniversary Issue of Vogue Italia in addition to Crash's Special Mode Issue. Scouted by Dominique Savri of Metropolitan Models in the South of France, Bruna's unique Italian/Congolese heritage has been championed by fashion's elite with runway appearances at Prada, Calvin Klein, Givenchy, Alexander McQueen, Chanel, Bottega Veneta, and Balmain. Bruna scored another runway coup donning wings in 2013 for the Victoria's Secret Fashion Show. At the Spring/Summer 2015 collections, Bruna's runway dominance continued with the birthday girl clocking up a stunning twenty-three show tally. If modelling indeed has a "New Aristocracy", Bruna would surely be its reigning Queen.